Greg Gattuso wanted back in. Somehow, some way, he had to have the responsibility of being a head coach again. He yearned to be in charge of a program, running a team his way. His style. His rules. His attitude. His team. 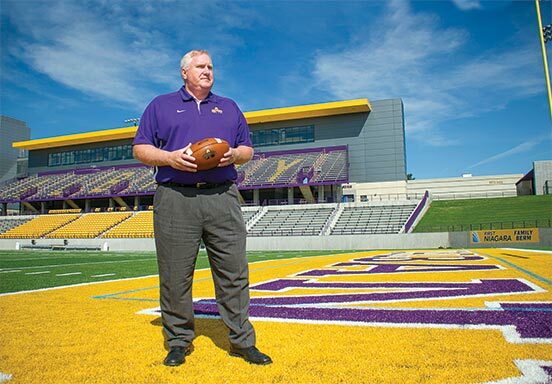 But if not for the lucky timing of reconnecting with an old friend, Bob Benson, now UAlbany’s defensive coordinator, the opportunity never would have come. “Honestly, I had no idea the [UAlbany head coach’s] job was even open. But the moment I found out, I was intrigued. This was what I was looking for,” Gattuso said. Gattuso put together an application immediately, becoming a candidate just before the deadline. And his timing could not have been better. Not only did he want UAlbany; the University wanted him. 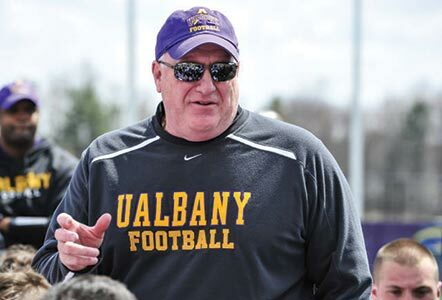 On Dec. 9, 2013, Gattuso was named UAlbany’s football coach, becoming just the second man to hold the position. Bob Ford, who was in charge for 44 years, led the Great Danes to 256 wins. Gattuso, 52, comes to UAlbany from the University of Maryland, where he spent the past three seasons as the defensive line coach and the previous two as the assistant head coach. Prior to Maryland, he spent six seasons at the University of Pittsburgh, primarily coaching the defensive line, and 12 seasons as the head coach at Duquesne University, leading the Dukes to a phenomenal 97-32 record, including eight conference titles. 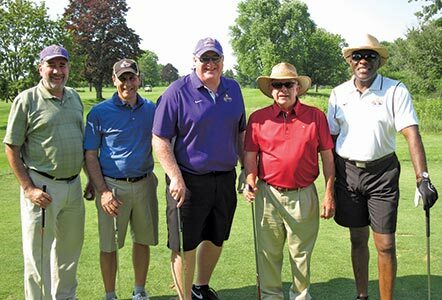 Above, from left: Former University President George Philip, B.A.’69, M.A.’73; John Bertuzzi, B.S.’76; Great Danes Football Head Coach Greg Gattuso; recently retired coach Bob Ford; and UAlbany President Robert J. Jones enjoy the UAlbany Football Alumni & Friends Golf Outing July 12 at the Normanside Country Club in Delmar, N.Y.
Before getting involved in coaching, Gattuso had an outstanding career as a player. He was a star in high school at Seton-LaSalle in Pittsburgh and then at Penn State, where he was a defensive lineman on the 1982 national championship team. Gattuso has coached on both sides of the ball throughout his career, and said he believed in a vertical offense and an aggressive defense. However, the task at UAlbany will be a challenge: Last season, in their Colonial Athletic Association début, the Great Danes went 1-11 overall and 0-8 in the conference. The move from the Northeast Conference to the CAA is a steep one, both in terms of talent and scholarship allotment. UAlbany is up to 61 scholarships now, two short of the maximum. Gattuso has fully immersed himself in the job and the community. He moved to Albany with wife Colleen and younger daughter Kaitlin, and has quickly familiarized himself with his players.